Home / Entertainment / Video / EB Problem Solving: A loveless woman looking for a husband asked for an advice! EB Problem Solving: A loveless woman looking for a husband asked for an advice! The Dabarkads found this lady's future husband in the most hilarious way. Watch the video below and it will surely make you laugh out loud! Whenever you have a problem and you wanted to an advice, go to the best advisers in this world, the JoWaPao! Ever since they created the EB Problem Solving lots of problems from the netizens were solved in very funny ways! These three comedians really knows how to handle such things and make everything funny. An episode last 2015, a 46-year-old lady was looking for a husband whom she can be with when she grows old. The lady who's name is Edna, wanted a guy who is kind, has a work, and specially she wants a guy who has a big body. Then Marian joked that she will be looking around for Aling Edna's future husband when she hilariously pointed the 3 body guards standing beside them. The funny part was when it became like a Dating Game. Marian asked the three guys what is the qualities they were looking for a woman. The first guy wanted a small woman, the second said he likes someone who has a colored hair and for the last guy he wants a woman who has white face. Their answers really made everyone laugh! For the last question, the three searches were asked, when given a chance where would they bring Aling Edna for a date. 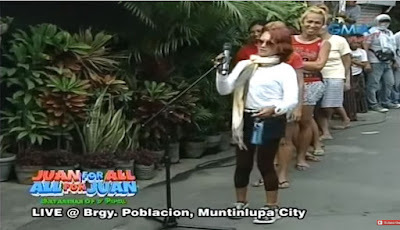 The first guy answered in a Ukay-ukay, second contestant said he would bring her to a beauty parlor, then they joked if its a 'funeral parlor', last one he wants to bring her to riot because he wanted a 'palaban' woman. Then after all the questions they gave Aling Edna a flower vase and she will give it to the guy she chose. Her final choice was the guy number one. Everyone's laughing because she really feels like it was real, they even danced! It's really never a dull moment when you watch Eat Bulaga's Problem Solving!